And the foundation grew. International (Brazil, Africa, the Mid East, sorry no Irish jigs or bagpipes), psych rock, dub and instrumental, hop hop, techno and turntablism…. techno, in particular really felt new at the time (there was always a bit of rock vs. techno war). The minimalist and reductive qualities were really attractive…. the Orb, David Holmes, Black Dog, DJ Spooky and Massive Attack are still favorites. Ironically, I was playing guitar in Kustomized at the time, which was as closet to “normal” punk influenced rock band as I have ever been in. I enjoyed my time in that group immensely. I have always planted unintended easter eggs along the way too. The Volcano Suns did Shriney and Malomondo. Kustomized did Le Geune. I even snuck one into Mission of Burma – The Mute Speaks Out. So, I guess was heading there for a long time! Another incredibly important ingredient in the mutant stew: a disavowal of the pop music notion that music is irrelevant, or not “music” without a central personality or “voice” carrying or propelling it. The singer, lyric, story. Let me be clear. From Elvis to Dylan to Bowie to Nick Cave to Andrew Falkous (Future Of The Left) and a million more, this is a glorious and wonderful side of music listening that I would never give up. The point is that it is not the only one. There is so much music and sound that is amazing, precisely because there is no one yammering at you. No life story, no sentimental hogwashin’. The music does the talking. Pretty cool. Previous Previous post: THANK YOU: FREE WILL IS FUNDED! 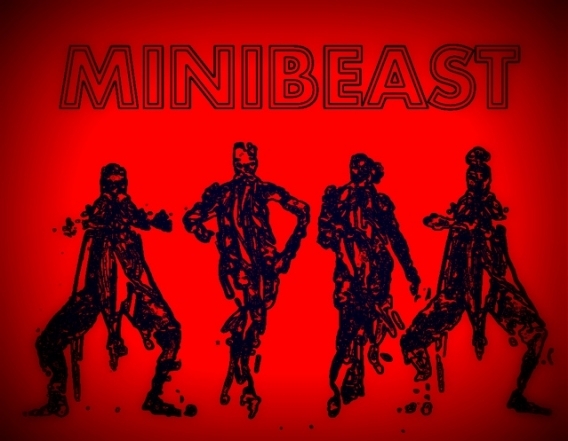 Next Next post: FRIDAY, MARCH 18TH: MINIBEAST LIVE IN NYC!